This sets the base type of the chart. The value can be pie, doughnut, bar, line, polarArea, radar or horizontalBar. A boolean for whether or not a legend should be displayed above the chart. This should be an array of objects that contain a data array and a label for each data set. If your chart is simple and has only one data set, you can use data instead of datasets and pass-in an array of data points. An array of labels for the X-axis. An object that contains options for the chart. You can refer to the official Chart.js documentation for details on the available options. In the above example we set the chart to be responsive and adapt depending on the viewport size. When using custom colors, you'll have to provide a color object literal for each data set. 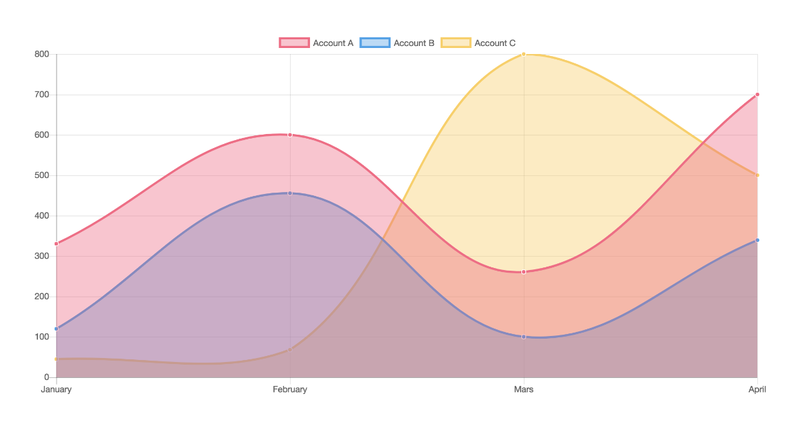 Two events are emitted, chartClick and chartHover, and they allow to react to the user interacting with the chart. The currently active points and labels are returned as part of the emitted event’s data. Of course, the beauty of Chart.js is that your charts can easily by dynamic and update/respond to data received from a backend or from user input. You’ll notice that we don’t mutate the datasets for our chart, but instead return new objects containing the previous data with the new data. Object.assign makes it really easy to do so. In this particular example we also give our method's argument a default value of 100 for our 3 datasets in case nothing is passed.